"Today Frankenstein is for the birds. But perhaps not for the terrified Mama Bird or perhaps Paternal Pterodactyl who doesn't quite remember that horrifying hungry thing being there when they had gone off hunting." 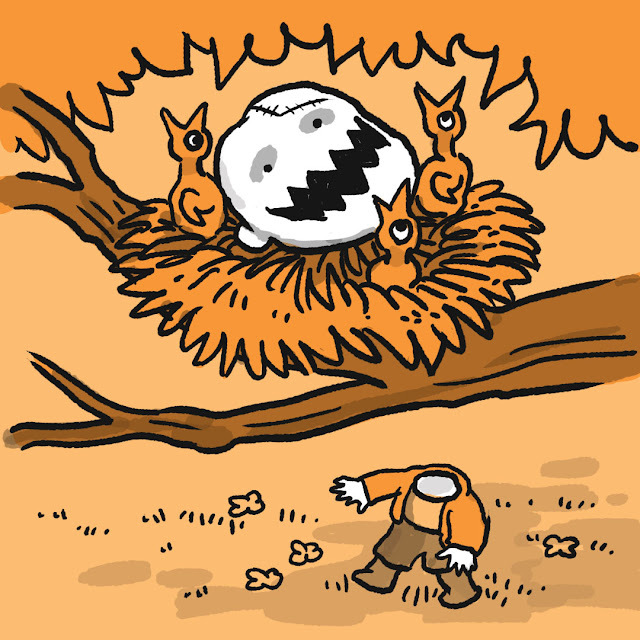 Commenter "c" takes the win with Frankenstein in a nest of baby birds! There are only four days left to get your Franken-idea drawn. Keep those silly comments coming! Frankenstein growing a garden...maybe with giant pumpkins and Venus flytraps? Frankenstein ordering at a monster restaurant. You can see the menu he's holding up and it has weird spooky foods listed. (things like "cream of cockroach soup" and "dead man's spaghetti.") By the way, this comment was posted by Clarissa Songer. Frankenstein hiking in the rain!